Some toys to keep your baby entertained and teething toys and teething gel if their teeth are coming through. A dummy is always a good idea too. Many people like to carry a camera to capture any special moments they might otherwise miss. So where to keep all that stuff? In a changing bag of course! There are hundreds to choose from. 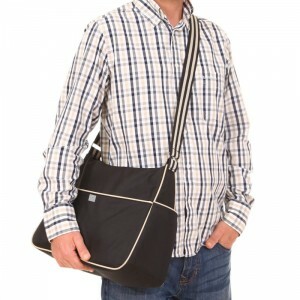 Most changing bags are over shoulder designs to carry on your shoulder, or to sling over both shoulders and wear like a messenger bag. Inside you usually find a number of compartments, 1 or 2 main compartments ideal for keeping changing mats, nappies, wet wipes and even laptops or documents. You often find a pocket on the side, ideal for carrying a baby bottle, or just a normal water bottle. There are often one or more velcro compartments on the outside ideal for easy access to things like breast pads, formula or any small items. The bag also comes with a handy insulated bottle cooler keeping the bottle cool or warm for longer. There are also of course plenty of pockets for keeping phones, wallets and keys in. The bag has 2 main compartments inside with a wipe clean divider between them. On the side it has another 2 smaller wipe clean pockets. And on the front a large velcro pocket for quick access to items. On the side it has a small pocket ideal for carrying bottles. The strap is adjustable to fit anyone, and the bag has attractive gender neutral styling. The zip pull and strap buckles are metal and will last a life time. The zip itself is a thick hard plastic, and is bigger than a normal zip on a bag such as this, so will stand up to plenty of use.